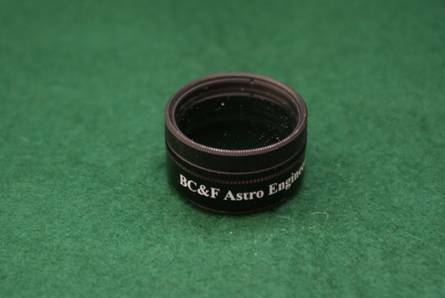 An astronomical filter is an accessory used by astronomers to simply enhance the details of an object they are observing (much as with amateur photography). 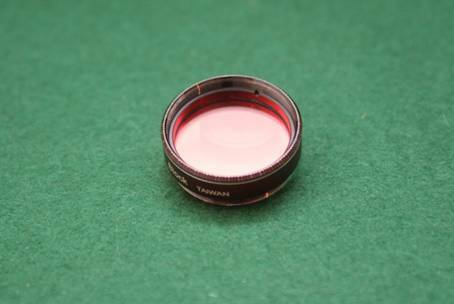 The most common filters screw into the bottom of the eyepiece body. Most astronomical filters work by blocking a specific part of the colour spectrum above and below a ‘bandpass’ significantly increasing the signal to noise of the interesting wavelengths thus giving the object more contrast or definition. While colour filters transmit certain colours from the spectrum and are usually used for observation of the planets and the Moon the polarizing filters work by adjusting the brightness and are usually used for observing the Moon. Broadband and narrowband filters transmit the wavelengths that are emitted by a nebula (by the Hydrogen and Oxygen atoms) and are frequently used for reducing light pollution. Colour filters work by absorption/transmission and can tell which part of the spectrum they are reflecting and transmitting. Filters can be used to increase contrast and enhance the details of the Moon and planets. Each of the visible spectrum colours has a filter and every colour filter is used to bring a certain lunar and planetary feature. For example: the #8 yellow filters are used to show darker features on Mars and Jupiter’s belts. 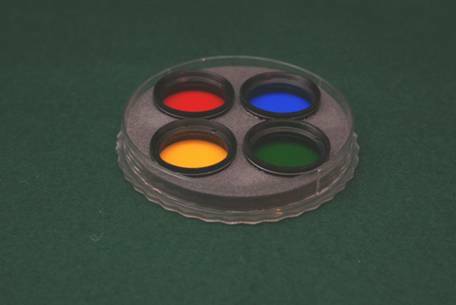 The ‘Wratten’ system is the standard number system used to refer to the colour filter types. It was first manufactured by Kodak in 1909. 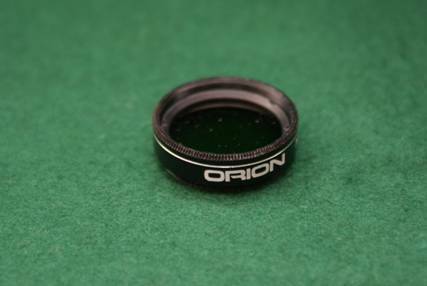 Chromatic aberration filters: Used for reduction of the purplish halo caused by chromatic aberration of refracting telescopes. Such halos can obscure features of bright objects especially Moon and planets. These filters have no effect on observing faint objects. Red: Reduces sky brightness, particularly during daylight and twilight observations. Improves the definition of maria on the Moon, ice and polar areas of Mars. These can be used to improve the contrast of blue clouds against the background clouds on Jupiter and Saturn. Deep yellow: Improves resolution of atmospheric features of Venus, Jupiter (especially in the Polar Regions) and Saturn. Increases contrast of polar caps, clouds, ice and dust storms on Mars. Enhances comet tails. Dark green: Improves cloud patterns on Venus. This filter can be used to reduce sky brightness during daylight observations of Venus. Increases contrast of ice and polar caps on Mars. Improve visibility of the Great Red Spot on Jupiter and other features in Jupiter’s atmosphere. Enhance white clouds and Polar Regions on Saturn. Medium blue: Enhances contrast of Moon. Increases contrast of faint shading of Venus clouds. Enhance surface features, clouds, ice and dust storms on Mars. Enhance definition of boundaries between features in atmospheres of Jupiter and Saturn. Improve definition of comet gas tails. Neutral density filters (also known in astronomy as Moon filters) are another approach for contrast enhancement and glare reduction. They work simply by blocking some of the Moon`s light to enhance the contrast. Neutral density filter are mainly used in traditional photography but are used in astronomy to enhance lunar and planetary observations. If the Moon is near ‘full’ and a new astronomer does not have a moon filter then it may be useful to lessen the glare by reducing the amount of light entering the telescopes. 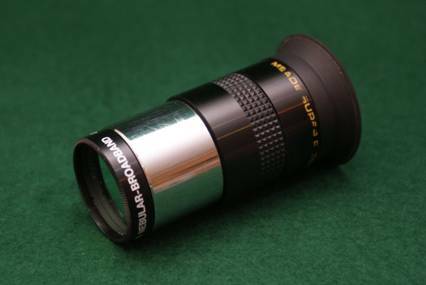 This can be done by fitting the dust cover over the telescope and removing the small cap to reduce the aperture. However using the full aperture of the telescope with a filter fitted does provide a better image. So if observing the Moon is an important aspect of future observing then for a small outlay of less than £20 to buy a moon filter will be money well spent. Polarising filters adjust the brightness of images to a better level for observing but much less so than solar filters. With these types of filter the range of transmission varies from 3% to 40%. They are usually used for the observation of the Moon but may also be used for planetary observation. Polarising filters consist of two polarizing layers in a rotating cell which changes the amount of transmission of the filter by rotating them. This reduction in brightness and improvement in contrast can reveal the lunar surface features and details especially when it is near full. Polarising filters must not be used in place of solar filters designed especially for observing the sun. The Broadband or light pollution reduction (LPR) filters are nebular filters that block the light pollution in the sky and transmit the H-alpha, H-beta, and O-III spectral lines which makes observing nebulae from the city and light polluted skies possible. These filters block the Sodium and Mercury vapour light, and also block the natural ‘skyglow’ such as the auroral light. The broadband filters differ from the narrowband with the range of wavelengths transmission. The broadband filters have a wider range because the narrower transmission range causes a fainter image of sky objects, and since the work of these filters is revealing the details of nebulae from light polluted skies it has a wider transmission for more brightness. Broadband filters are particularly designed for nebulae observing, are not useful with other deep sky objects. However it can improve the contrast between the object being observed and the background sky and may clarify the image. 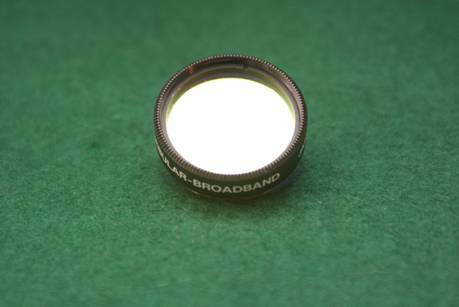 Narrowband filters are astronomical filters that transmit only a narrow band of spectral lines (usually 22nm or less). These filters are mainly used for nebulae observation. Emission nebulae mainly radiate the doubly ionized oxygen in the visible spectrum that emits near 500nm wavelength. These nebulae also radiate weaker at 586nm from the Hydrogen-beta atoms. Hydrogen-beta and Hydrogen-alpha are the narrowest of the three filters, with 8nm range. The UHC filters range from 484 to 506nm. It transmits both the O-III and H-beta spectral lines, blocks a large fraction of light pollution and brings the details of planetary nebulae and most of emission nebulae under a dark sky. Infrared cut-off filters, sometimes called IR filters or heat-absorbing filters, are designed to reflect or block mid-infrared wavelengths while passing visible light. They are often used with webcam video cameras to block IR due to the high sensitivity of the camera sensor to near-infrared light. These filters have a red hue to them so they also sometimes block some of the light from the longer red wavelengths.